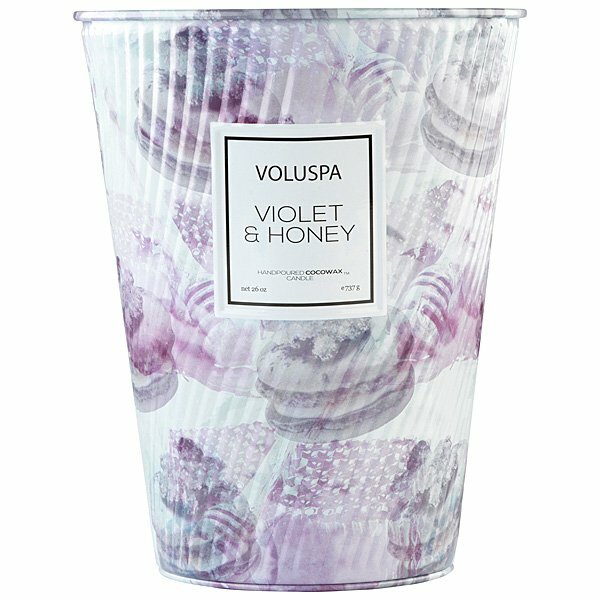 Voluspa Violet & Honey 2 Wick Tin Table Candle is sweet crème, lavender honey and sugared violet petals. Because size does matter! A feast for the senses, the oversized metal cone shaped design of Voluspa's "Ice Cream Cone" 2 Wick Tin Table Candle delivers on every level. Filled with 26oz of fragrant macaron inspired COCOWAX, the colorfully decorated swirl textured container makes an impact both visually and fragrantly. The lid keeps the candle dust free between uses and may also be used to extinguish the candle when desired.